Cleveland-Cliffs (NYSE: CLF) has historically been a U.S.-centric company before its expansion into the Asia Pacific region (APAC), which largely enabled the company to cater to customers in Asia through the seaborne iron ore market. However, the APAC operations experienced an extended period of declining revenue from 2012-2015 as a result of declining prices amid a supply glut on the seaborne market. As a result of a change in management in 2014 amid the period of declining prices, the company decided to focus on the more predictable US market going forward. The recent change of the company’s name from Cliffs Natural Resources to its historical name of Cleveland-Cliffs Inc. is indicative of the change in the company’s priorities geographically. 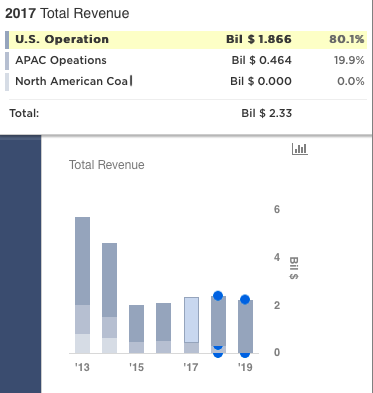 The above graph has been created using our new interactive platform, you can modify our assumptions to see the impact on the overall revenue share of the company. The company’s APAC business experienced a loss for the first time in Q4 ’17 wherein the adjusted EBITDA from its APAC operations stood at a negative balance of $ 3.4 million. Although the full year results from the APAC operations ended in the green, the negative result might force the company to shut their APAC operations by the end of 2018. Cliff’s had earlier anticipated ceasing its APAC operations by 2020. However, Cliffs’ APAC operations were further distressed by a change in preference for high-grade ore by its largest consumer, China. This distress was in addition to the general pricing pressure faced from the larger iron ore miners such as Vale, BHP, and Rio in the seaborne market. On the U.S. operations front, however, the company’s operations have remained healthy throughout the years and have been gaining strength through the company’s strategic initiatives. The company has established a dominant position in the US market accounting for roughly 54% of the total U.S Iron Ore Pellet production capacity. Additionally, the company’s planned $700 million investment in a Hot Briquetted Iron plant (HBI), which is expected to make the company the dominant supplier to the 3 million metric ton Electric Arc Furnace (EAF) steel market in the Great Lakes region by 2020, would result in Cliff’s becoming a superior iron ore player in the U.S. Looking ahead, we anticipate Cliffs’ APAC operations to cease operations at the latest by 2019 and its North American region to deliver 100% of the company’s revenue. We have a $6.23 price estimate for Cleveland-Cliffs which is 16% below the market price. Have more questions about Cleveland-Cliffs? See the links below.